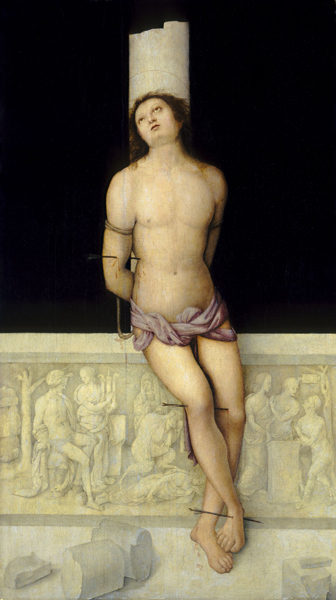 Explain that the painting represents Saint Sebastian, a Christian condemned to death by the Roman emperor Diocletian. Sebastian miraculously survived execution by arrows. 1) Q: What visual evidence suggests the impact of classical artifacts on this painting? 2) Q: In what respects has the body been idealized? 3) Q: What purpose does the bas-relief serve? 4) Q: Renaissance artists often employed the broken column to symbolize the virtue of fortitude — here, Sebastian’s miraculous fortitude in withstanding the assault by Diocletian’s archers. What other meaning(s) might the broken column and fallen fragments convey in this painting?